(GOLDENDALE, Wash., April 16, 2019) —Maryhill Museum of Art today announced a collaborative printmaking project featuring 11 artists working with communities along a 220-mile stretch of the Columbia River from the Willamette River confluence to the Snake River confluence. The Exquisite Gorge Project will connect artists and communities to create a massive 66-foot steamrolled print. The unique project takes inspiration from the Surrealist art practice known as exquisite corpse. In the most well-known exquisite corpse drawing game, participants took turns creating sections of a body on a piece of paper folded to hide each successive contribution. When unfolded, the whole body is revealed. 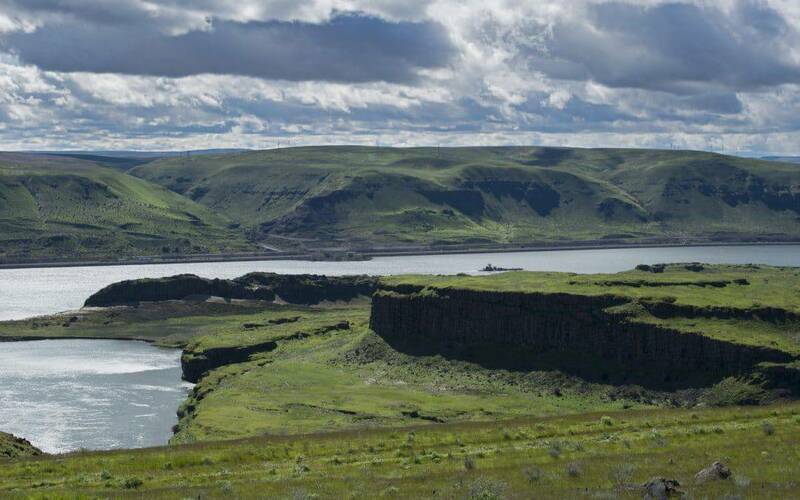 In the case of The Exquisite Gorge Project, the Columbia River will become the “body” that unifies the collaboration between artists and communities, revealing a flowing 66-foot work that tells 10 conceptual stories of the Columbia River and its people. Artists will work with community members from their assigned stretch of river and carve images on 4 x 6 foot wood panels. Each completed panel will then be connected end-to-end and printed using a steamroller. The big steamroller print event will take place on Saturday, August 24, 2019 on the grounds of Maryhill Museum of Art and the public is invited to participate. The resulting print will be on view in Maryhilll’s M.J. Murdock Charitable Trust Education Center from September 3 -25, 2019, with the possibility of other venues added in the future. This project would not be possible without a range of partners along the Columbia River, who are helping facilitate the project and connecting artists with communities. The partners involved are: Maryhill Museum of Art, Lewis & Clark College, Arts in Education of the Gorge, The Dalles-Wasco County Library, The Gorge Veterans Museum, The Dalles Art Center, Goldendale-Fort Vancouver Library System, Whitman College, and White Salmon Arts Council. Information on how the public can connect with artists will be disseminated by each of the participating partners. Similarly, Portland artist Roger Peet, who will create Section Seven of the print, underscores the importance of collaboration in The Exquisite Gorge Project. *Artist bios below provide more information on each artist or group. To date, sponsors of The Exquisite Gorge Project include Klickitat County, Department of Economic Development, Lodging Tax Award, with additional support provided by Vonda Chandler, Gunkel Orchards, Maryhill Winery, Jo Dean and Juris Sarins, Little Bear Studio, LLC, and many of the museum’s partners on this project. For opportunities to support this great project, contact Colleen Schafroth 509 773-3733 x 23 or email development@maryhillmuseum.org. Neal Harrington: a working, award winning woodblock print artist residing in Russellville, Arkansas, Neal’s family is originally from the Portland area. He has a Master’s degree in Fine Art (Printmaking) from Wichita State University in Kansas. His work fuses Greek/Roman and American mythologies to create an almost musical narrative. Molly Gaston Johnson: a teaching artist at Ocean County College in Toms River, New Jersey, Molly has an MFA and over 5 years professional education in printmaking. She has a family connection to Lewis and Clark, and experience working collaboratively with communities in creating works of art. Jane Pagliarulo: a Portland, Oregon artist, she owns Atelier Meridian, a collaborative printmaking studio. She has experience with large print formats, including “steamroller” printmaking, as well as engaging communities in these projects. Steven Muñoz: currently working in Washington, DC, Steven has over 15 years professional experience. He is the director of a community arts center and has a BFA with a concentration in printmaking. He has experience with large format printing and has been focusing on creating a narrative about flora and fauna. Roger Peet: a Portland, Oregon printmaker, Peet is represented in Maryhill’s collection. His work often describes the tension between human activity and the natural world. He often works collaboratively with the community in various media and produces socially focused environmental artwork. Michael McGovern: this Portland, Oregon artist has a Masters in Fine Arts in printmaking from Northern Illinois University. He has a connection to the gorge through an artist residency at the Wasco County, The Dalles Library. He has experience in large-scale woodblock printing and community collaborations. Lewis & Clark College / Michael Namkung: led by Professor Namkung, students from Lewis & Clark will work as the “community” in creating the design and carving the block for this project. They will be involved in the printing at Maryhill. Whitman College/Nicole Pietrantoni: led by Professor Pietrantoni, who has experience with large, steamroller print projects, students will work as the “community” in creating the design and carving the block for this project. They will be involved in the printing at Maryhill. Combat Paper/Drew F. Cameron: this group traditionally takes combat uniforms and transforms them into paper upon which prints are created. This group will work with veterans from the Columbia River Gorge to create an original woodblock of a segment of the river, led by Drew Cameron. Ken Spiering: a professional artist and art educator, the river has been central to his art as a metaphor for the human condition. Spiering will be creating a unique frontispiece to introduce the 66’ image that follows.